Kevin Harvick seems unstoppable. Harvick won his fifth race of 2018 Saturday holding off Martin Truex Jr. for the win. 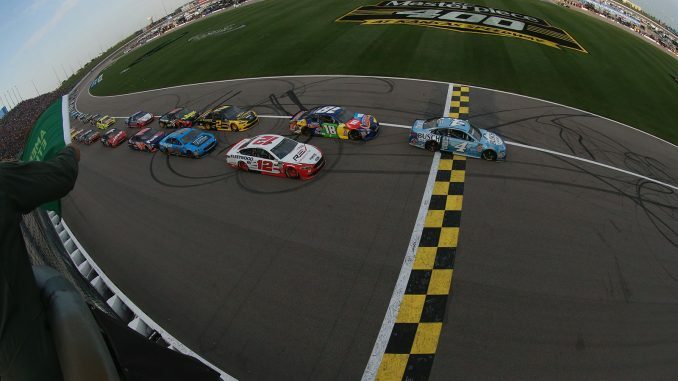 Here’s how it all went down Saturday at Kansas Speedway. From his second pole of the season and his fourth at Kansas, Harvick led the field to the green. Ryan Blaney, Kyle Busch, Aric Almirola and Brad Keselowski rounded out the top five. Kyle Larson was the only driver sent to the rear after a spin in qualifying that left him with a 22nd starting spot. Harvick had the lead on the inside by turn 1; Blaney and Kyle Busch were side by side for second as Keselowski lurked close behind. By the end of the first lap Blaney had second, Busch was third Keselowski and Almirola followed. Due to heavy rains the night before, NASCAR had called a competition caution and that flew on lap 30. The leaders pitted; William Byron was out first with only two tires followed by Blaney, Harvick, Joey Logano and Denny Hamlin. Byron was hit with an uncontrolled tire. Green came out to start lap 35; Blaney led followed by Harvick, Kyle Busch and Logano. Blaney had the lead by lap 1 as Kyle Busch slipped back; Blaney, Harvick, Keselowski, Logano and Almirola were the top five. After starting in the back of the field, Larson was inside the top 10 by lap 45. Larson was sixth by lap 56. Jimmie Johnson pitted from 20th on lap 62 reporting that his car felt like it had a loose wheel. He came out 29th a lap down. With less than 8 to go in stage 1 , Blaney was in traffic and Harvick was catching him, erasing a lead of over a second. Johnson was fighting to not lose another lap with 6 to go in the stage. Bubba Wallace lost a right rear tire and nearly spun on lap 78. He was 29th at the time. On lap 76, Harvick was looking for the lead. The battle for the lead allowed Johnson to move away to remain the first car one lap down. On the final lap of Stage 1 the leaders were fighting for the top spot; Blaney held on to win Stage 1. Top 10 Stage 1: Blaney, Harvick, Keselowski, Logano, Larson, Almirola, Hamlin, Kyle Busch, Kurt Busch and Clint Bowyer. During his stop as the stage ended, Wallace was penalized for an uncontrolled tire. The leaders pitted; Harvick was out first followed by Blaney, Keselowski, Hamlin and Logano. Green came out to start Stage 2 on lap 89; Harvick took the lead on the inside by turn 1; it was three wide behind with Keselowski coming out the second spot; Blaney had third by Logano was looking for the spot. By the end of lap 90 the top five were Harvick, Blaney, Logano, Larson and Keselowski. Behind, Johnson and Kenseth were fighting for the free pass spot in 24th. The lead was 1.2 seconds by lap 100 as Larson and Logano were dueling for third. Larson was able to take third on lap 102. Keselowski pitted with a loose wheel on lap 106; he came out 24th one lap down. Kyle Busch took fourth from Logano on lap 108 after inheriting fifth from the pitting Keselowski. Harvick reported a possible loose wheel; the crew looked at a replay of the last stop and said the crew had gotten all the lug nuts so he continued. Keselowski reported another loose wheel again and came back in on lap 120; Hamlin also pitted. Others deeper in the field were also splitting the stage and started pitting. Harvick pitted on lap 123; Blaney stayed out to lead. Blaney pitted a lap late; Larson followed. The rest of the lead group also pitted. Austin Dillon stayed out then pitted on lap 130. The top five: Harvick, Larson, Blaney, Kyle Busch and Kurt Busch. As Dillon was pitting, Larson went high as Harvick went low and Larson took the lead on lap 131. Larson’s lead was hovering around a second by lap 141. Logano took fifth on lap 143. With 10 to go in Stage 2: Larson, Harvick, Blaney, Kyle Busch, Logano, Almirola, Kurt Busch, Bowyer, Erik Jones and Martin Truex Jr.
Harvick was charging for the lead with 3 laps to go in the stage. Larson was able to hold off Harvick to win stage 2, on the last lap Johnson was put another lap down. Top 10 Stage 2: Larson, Harvick, Blaney, Kyle Busch, Logano, Almirola, Kurt Busch, Bowyer, Erik Jones and Martin Truex Jr. The leaders pitted. Larson was out first followed by Harvick, Blaney, Kyle Busch and Logano. Green came out to start lap 168. Larson had the lead on the inside by turn 1; Harvick fell in behind; Blaney, Kyle Busch and Logano followed. Kyle Busch was reporting a vibration by lap 169. The top five at lap 198 Larson, Harvick, Blaney, Logano and Kyle Busch; there were 18 cars on the lead lap. Green flag stops started on lap 211. Harvick pitted on lap 213; Larson followed a lap later. Ricky Stenhouse Jr. stayed out hoping for a caution; he inherited the lead. Stenhouse pitted on lap 225; Larson retook the lead followed by Blaney, Harvick, Logano and Kyle Busch. The lead for Larson was 3.5 seconds. By lap 233 however, Blaney was starting to chip away at the lead. Kyle Busch took fourth on lap 235. On lap 236 Daniel Suarez two laps down got loose and made contact with Alex Bowman in 14th; both drove away as the first caution of the night for an on-track incident came out. The leaders pitted. Larson was out first followed by Harvick, Blaney, Logano and William Byron who took only two tires. Green came out to start lap 242; 25 laps to go. Blaney pushed Larson to the lead but Blaney got loose exiting turn 2; Harvick was on the outside and by the start of the next lap had the lead. Logano had momentum and took second. Larson was third, Kyle Busch fourth and Blaney recovered for fifth. 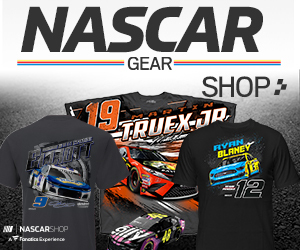 Blaney moved up and took fourth; he was looking for third from Larson on lap 247; the two got together on the frontstretch just past the start-finish line; Blaney cut a right front tire and ended in the wall in turn 1. Caution came out. Blaney was done, Larson continued. Most of the leaders pitted. Six cars stayed out; Logano, Truex, Jones, Hamlin, Ryan Newman and Chase Elliott. Larson had to pit again when the crew reported they had not got all the lug nuts tightened. Among those who pitted, Byron again took only two tires and was out first followed by Harvick, Kyle Busch and Bowyer in the top 10. Green came out to start on lap 251, 15 to go. It was three wide with Jones on the bottom Logano in the center and Truex on the to; Truex had the momentum and took the lead. Behind them a multi-car crash erupted. Byron got loose exiting turn 4 and went nose first into the outside wall sweeping up Bowyer; Byron’s car went up and over the car of Newman. Also involved when the smoke settled; Matt Kenseth, Ty Dillon, Jamie McMurray and Chris Buescher. All the cars were done except Bowyer, the drivers unhurt, and NASCAR put out the red flag. The top five under red; Truex, Logano, Jones, Hamlin and Elliott. The red flag was lifted after 13 minutes 13 seconds. None of the leaders pitted; there were 15 cars on the lead lap. Green came out with 9 laps to go. Truex was able to get away; Hamlin took second, but Harvick with fresher tires soon had second and was looking for the lead. It was three wide for third place; Jones, Logano and Hamlin. Logano emerged in third. Larson on the outside took fifth on lap 260 then fourth a lap later. Up front Harvick was trying to chip away at the lead; it was under a half a second with 3 to go. With two to go Harvick was at the rear of Truex; as they came to one to go, Harvick took the lead. Truex had nothing for Harvick and Harvick scored the win. It was his second consecutive win and his fifth of the year. Behind Truex, Logano was third, Larson fourth and Hamlin fifth. Paul Menard was sixth with Jones, Kurt Busch, Almirola and Kyle Busch rounding out the top 10. Next up in the Monster Energy NASCAR Cup Series All-Star Race at Charlotte Motor Speedway next Saturday night. The next points race for the Cup series is the Coca-Cola 600 at Charlotte on May 27.